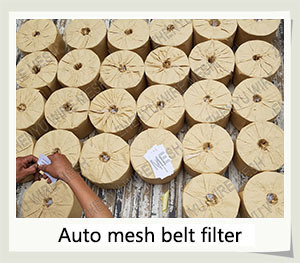 Auto mesh belt filter-- Anping County Zhenyu Metal Mesh Products Co.,LTD. 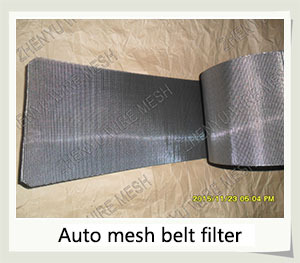 Auto mesh belt filter (also known as Auto Extruder Filter Belt, Plastic Extruder Filter Belt, Reversible Dutch Mesh,Contrast Mat Net, Reverse Dutch Weave Wire Mesh Belt For Plastic Extrusion Changers ) using the dense warp, thin weft knitting method, used in plastics extruder solution filtration, chemical mechanical filtration, such as solid-liquid separation filter, so that in cleaning backwash filter oil, residues process has good mechanical stability and filtering accuracy. 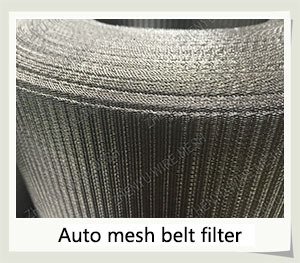 With smooth surface, high hardness, network continuously, not deformation, high temperature resistance, corrosion resistance, the advantages of flexible network, has excellent filtering performance. 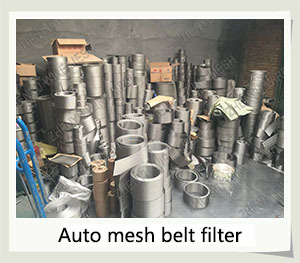 Widely used in aerospace,petroleum,chemical,chemical fiber,machinery, plastic products,research and plastic melt filter,molding machine belt type filter conveyor industries.